Following his death, Iemitsu was given the name Taiyuin from the Emperor. Taiyuin refers to a person that has accomplished great political achievements. At Taiyuinbyo, the view changes each time you pass through one of the five large or small gates; people say that you feel as though you are rising up to heaven when you walk through the path to the main sanctuary from the Niomon gate, or the two guardian Deva gate. After passing through the Deva gate, the entrance of Taiyuin, a large gate comes into view. This is the Nitenmon gate. The Nitenmon gate features two of the four Indian guardian deities that were incorporated into Buddhism: Dhrtarastra and Virupaksa. Placed in the background are the Wind God and the Thunder God (the most familiar natural phenomena, strong wind and thunder, that have been deified). After passing through the Nitenmon gate and climbing up to the top of the stone steps, you will see hanging lamps everywhere. The view from here is likened to the view from heaven. The first entrance to the grave is the Yaksha gate. Your eyes will be attracted to the vivid colors of the statues. In total four Yaksha (Indian guardian deities/demonic warriors incorporated into Buddhism) are placed at the front and the back on the right and the left to protect the grave. At the front of the Hall of Worship after passing through the Yaksha gate is the Chinese-style gate which is located at the center of Taiyuinbyo. Though small in size, the entire gate is covered with detailed carvings and the gate’s gold and white based colors are profoundly elegant. The walls on the side of the gate are covered entirely with carvings of pigeons. Some say that the pigeon is a symbol of the relationship between Ieyasu and Iemitsu. To get to the grave of Iemitsu located at the very back of Taiyuinbyo behind the main hall, one must pass through the Kokamon gate. This breathtaking structure is also called Ryugumon (dragon palace style gate) because elements of Chinese architectural styles were incorporated into its design. When you look up while passing through the gate, you will see heavenly maidens on the ceiling; they symbolize that you are about to enter a sanctuary. Visitors cannot pass through Kokamon as it is not opened to the public. Straddled by 3 prefectures: Gunma, Tochigi and Fukushima, the total area is 114,908 hectares. The park inside can be divided into 3 zones (Nikko, Kinugawa/Kuriyama, Nasu Kashi/Shiobara). To enjoy this national park, let us introduce the spots that should be visited first. Nikko Yumoto Visitor Center is a facility that gives out information on Oku-Nikko in Nikko Yumoto Onsen Town. News on conditions of walking paths and flower blossoming along with a calendar on places to see are displayed. Information on campgrounds, hiking and mountain-climbing is also provided. Oku-Nikko is an area for bears and information about them is a must. Events matching the seasons for walking, bird-watching, snowshoeing, etc. are held all throughout the year. Next to Lake Chuzenji, the exhibit room on the 2nd floor displays models of the flora and fauna of Oku-Nikko. In the shop, there are many original goods including calendars and bear bells. The Imperial villa in Nasu was used as a place of rest for Emperor Hirohito. On the 20th year of his reign, the emperor took the opportunity to give half of the villa (560 hectares) as an area to be returned to its natural state, and in 2011, Nasu Heisei-no-Mori Forest was opened. Two areas were organized. The Forest Recreation Zone is an area where you can enjoy a stroll free of charge. It’s even wheelchair-accessible and there’s a path leading up to Komadome Falls. You can go through the forest in about 1 hour. The Forest Learning Zone is a paid zone with a guide. You can enjoy even more rugged nature here with the purpose of learning. English pamphlets are available. An English-speaking guide is possible with prior consultation. The garden was established in 1902 as a research and educational area for alpine plants and cold-weather flora. Afterwards, part of the former Tamozawa villa and the adjoining area were donated to the garden to create a total area of 106,980㎡. There are rivers flowing within the huge garden, and with Japan’s first Western-style horticultural site of Rock Garden and the bog gardens which use an abundance of water, you can view an alpine landscape that re-creates a highland beech forest among other things. The spring is the time to see the cherry blossoms and rhododendron. The rhododendron which blooms in mid-April is related to the representative azalea that marks a Nikko spring. Immediately afterwards, the cherry trees start blossoming heralding the arrival of the season. From spring to summer, Mizubasho Pond is a place to see. In mid-April, skunk cabbage (mizubasho) blossoms in the hundreds as their white spathes become very noticeable. Violet irises provide color around the pond in early summer. There is one spot for autumn foliage. 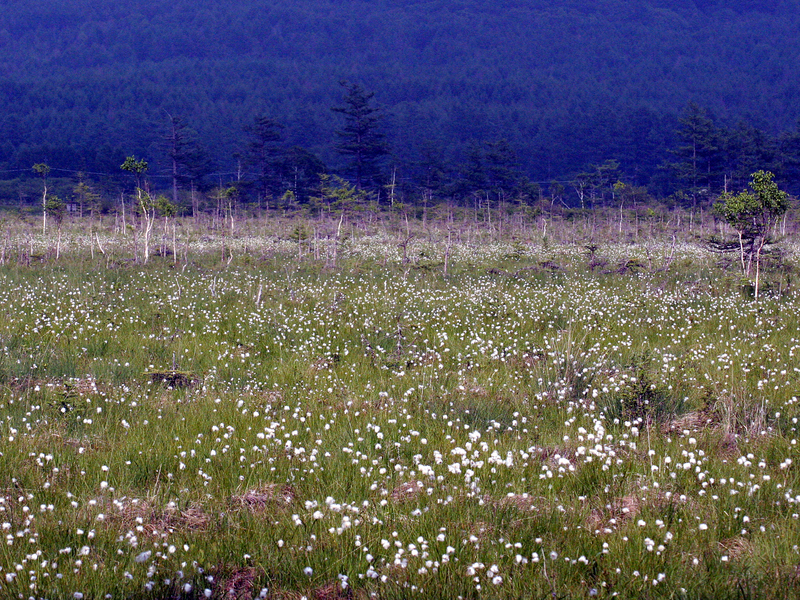 21 out of the approximately 28 wild species in Japan are cultivated here. From late October to mid-November, you can enjoy the changing colors of autumn everywhere in the garden. The garden path running alongside the Daiya River becomes a red carpet of fallen leaves. Nikko Botanical Garden is closed annually from December 1st to April 14th. Winter plants are few because of the cold region, and with the dangers of snow accumulation, maintenance is necessary. At the Tamozawa River flowing inside the garden, there is the Kayoimi Bridge. When this area was part of the Imperial villa, the Imperial family led by the Emperor went back and forth over the bridge. Refined stone lanterns stand silently, and you can catch a glimpse of what a Japanese garden of that time was like. This is a place that was formed from the lava from the eruption of Mt. Nantai. This gift from the great land of a lava-formed ravine is a soothing walking course along the Daiya River. It is also a place where the current suddenly accelerates due to the lava blocking the river. Because the river flows with the echo of kanman (full of malice), it was named Kanmangafuchi. You can enjoy the wonder of the sound and scenery of the Daiya River. Nishimachi Taishi-do Hall is a small shrine painted in red where Prince Shotoku is enshrined (a structure that enshrines a god). Prince Shotoku brought together an excellent group of craftsmen to build Horyu-ji Temple. Those wonderful techniques were also requested in Nikko. Passing Nishimachi Taishi-do, walking upstream along the river will bring you to the main gate of Jiun-ji Temple. Going further upstream after passing through the main gate, there will be ghost jizo statues lined up along the route. 70 of these statues remain out of the original 100 after a major flood in the Meiji Era. One head of the jizo was found on the river bed and is currently enshrined at Joukou-ji Temple. The statues have been called ghost jizo since the number of statues differs depending on whether you’re coming or going. Kanmangafuchi has a lot of fog so there is a mysterious atmosphere. After passing Jiun-ji Temple, there is Reihikaku which sticks out into the river and was built at the same time as Jiun-ji. The large rock on the opposite bank is where Acala The Fire God is worshipped (an envoy of Shingon Buddhism), and it is a place where services are held while facing the rock. A statue of Acala had been there before but it was washed away in a flood. Nikko-zan Rinnoji is a collective name for a number of halls and pagodas as well as 15 sub temples. The center of Rinnoji is the main hall, Sanbutsudo, which is the largest wooden building in East Japan. Inside the hall are three enormous shiny golden Buddha statues. The main hall (Sanbutsudo) is currently undergoing “the great repair of the Heisei period” but visitors can view the interior of the building and pray to the three Buddha statues during the construction period despite the repair work that is going on. Gohanshiki ceremony is held on April 2 every year. It starts out by sharing offerings with the visitors. At the ceremony, the participators are forced to eat a huge bowl of rice. It is said that the ceremony viewers will be free of any illness and that they receive luck that causes their family to prosper. In August, torchlight Noh performance is held. At this event, Noh and Kyogen plays are performed outdoors during the night while lighting the stage with bonfire torches. Noh and Kyogen are designated as intangible cultural properties and are the world’s oldest forms of theatrical art: Noh performance combines dance, acting and music while Kyogen is a theatrical performance consisting of spoken dialog and stylized movements. A popular event held annually on New Year’s Eve is the Saitodaigomaku ceremony. Starting at 11:45 p.m., special firewood carrying people’s wishes are burned for about 50 minutes; people standing around the bonfire pray for good luck and get their bad luck of the coming year cast away by the fire and the rising smoke. While visitors should dress warmly since it is quite cold, you can also borrow small blankets from the temple. The Shoyoen garden in the temple grounds is known as a great spot for viewing fall foliage. The trees are lit up every year during the fall foliage season. The garden stretches long from the east to the west with a distant view of Mount Nantai and Mount Nyoho; stroll around the pond and enjoy the dynamic views created by employing a “borrowed view” landscape gardening technique which takes in even the views of the mountains in the distance as the garden’s background. The discovery of Nikko happened in the 8th century during the Nara Era. When Mt. Nikko was first explored, steep cliffs and the rough waters of the Daiya River were major obstacles. The bridge’s legend began when the monk Shodo Shoin prayed to the gods there and the god Jinja-Daiou appeared, with two snakes transforming into a bridge which he could cross. Only used in special cases for events or when the shogun was passing through, ordinary people traveled over Nikko Bridge downstream. Although Shinkyo Bridge can be traversed for a fee, it is currently closed so crossing over it is impossible. Among the important events is the annual cleaning. Every year in December, Shinto priests in Heian Era kariginu clothing and eboshi headgear along with shrine maidens in white clothing and red skirts use 4m bamboo poles and sweep away a year’s worth of dust as a custom in preparation for the New Year. Approximately 3m poles sweep the dust off the 28m-long bridge so that it is not damaged. By around noon, the brilliance of the vermillion increases and the bridge’s elegant appearance returns. Late October to early November is the best time to see the autumn colors at Shinkyo Bridge. With the blue of the river, the vermilion of the bridge and the gold of the trees, the scene comes to resemble a painting. In particular, the time of the soft light in the morning creates a divine mountain, a landscape that is befitting of Nikko. At night, the area is illuminated. This occurs from late October to early November for a period limited to 3 days. The two shrines and one temple of Tosho-gu, Rinno-ji and Futara-Arayama are lit up along with Shinkyo Bridge. The collaboration between World Heritage Sites and autumn leaves being illuminated takes you into a fantastic world. It is a precious event to be appreciated. The shrine grounds, which are only second to Mie Prefecture’s Ise Shrine in size, contain sacred cedar trees which are said to be 1000 years old, and evoke a grandeur with structures such as the main hall and front hall which are among the oldest buildings on Mt. Nikko. Aside from the main shrine, there is Chugushi Shrine north of Lake Chuzenji and a rear shrine on the top of Mt. Nantai. You can get an air that is different when compared to the adjacent Tosho-gu. There is Omotesando Road that connects Nishisando Road, which connects straight from the national highway, and Tosho-gu. Omotesando then splits into Uwashinmichi Road and Shimoshinmichi Road, with the cedar-lined paths giving that divine feeling. On Uwashinmichi, there are 37 stone lanterns that are lined up in an orderly pattern which makes for a popular road to the shrine. Within the shrine gardens, there is the Futara Reisen spring surrounded by large stones. Two streams feed into the spring, one of which (Yakushi Reisui) is from a cave on Mt. Korei. It’s said that drinking from that stream cures any eye diseases. The other stream is the famous water that pours into Tengusawa. It’s been called “The Fountain of Sake” since the quality of the water affects the production of sake. At the adjacent tea room “Azumaya”, you can try drinks that use this water. Right at the entrance, there is a copper lantern which has been called a ghost lantern. When it was lit up, it acted strangely so that the warriors assigned to guard the shrine attacked it, and the lantern has over 70 scars thus giving it its name. There are many cedar trees that have been called sacred trees in Futarasan Shrine. Two of them share one root and stand up against one another so that they are called the husband-and-wife cedars (fuufu sugi), while another three sharing one root have been called the family cedars (oyako sugi). Another group of three cedars have been compared to a goddess descending from Mt. Nyohou, and then just past the large torii gate at the front to the right are the marriage cedars. Watching these cedar trees stretch out straight into Heaven possesses an overwhelming power. Kegon Falls is located by the outlet for Lake Chuzenji which was formed from the eruption of Mt. Nantai. The underground water from the steep cliffs flows out forming 12 small waterfalls that are wrapped into the main waterfall which creates a unique scene. Monk Shodo Shonin has been credited as the first discoverer of Nikko, and the name of the waterfall is derived from the sacred book of Buddhism, “Kegon Kyo” (Avatamska Sutra) of the Tendai sect. A waterfall with a long drop in elevation needs a certain amount of water. Around the waterfall basin, the fairly high water pressure flying out feels like a driving rain. The 4.5m-deep basin has a mysterious atmosphere. Designated as a National Place of Scenic Beauty, Kegon Falls has been recognized by many organizations for the wonder of its scenery, including its selection as one of Japan’s 100 geological features. There are observation areas at the top and bottom of the falls. An elevator at the base of the falls goes down 100 m, and through an underground path, you can reach the waterfall basin. Spanning 3 floors, you can freely come and go. Following the rainy season and typhoons, the amount of water rises and you can witness a lively show of huge sound and water spray. From Akechi-Daira Observation Platform, you can take in the entire view of the waterfall flowing from Lake Chuzenji. Taking 35 minutes by bus from Tobu-Nikko Station, there is the ropeway going up near the end of the No. 2 Iroha slope that will take you from Akechi-Daira Station to Akechi-Daira Observation Platform (a 3-minute ride). You can feel the grand scale of the sight that cannot be seen from the bottom. Kegon Falls does not freeze over. However, in January and February, the 12 small surrounding waterfalls do. Due to this, the waterfall as a whole takes on a blue color and as a result, the effect has been called blue ice. The spring and fall are fine, but the waterfall of snow and ice also leaves a considerably deep impression. If you are interested to know more and save your time during your trip to Nara, You can send a message to our local guides to get a customized itinerary and quotation for an unforgettable experience.